Dorothy Gilman (1923-2012) wrote children’s books under her married name, Dorothy Gilman Butters, for a number of years before starting the popular Mrs. Pollifax series. 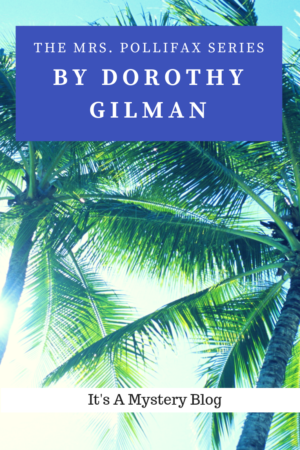 Gilman traveled extensively and used her experiences to send her protagonist to exotic locations throughout the world. Mrs. Virgil (Emily) Pollifax of New Brunswick, New Jersey, is a widow with grown children and an unremarkable life. She is tired of attending her Garden Club meetings and frankly, is more than a little depressed. She wants to do something good for her country, so she begins to volunteer as a CIA agent. The protagonist, Mrs. Pollifax, is smart and personable. You want to be friends with her or, better yet, have her as your grandmother. The mysteries are not predictable because Gilman has a talent for surprising the reader. The stories are still fresh and relevant, which is amazing given the first one was written over 50 years ago. Being a CIA agent allows Mrs. Pollifax to travel throughout the world and you get to travel with her. Before I prepared the list, I thought I had read all the books in the series. Now I see I have missed two novels. Time to hunt them down! A special thank you to Karen for introducing me to these books and supplying most of the copies.